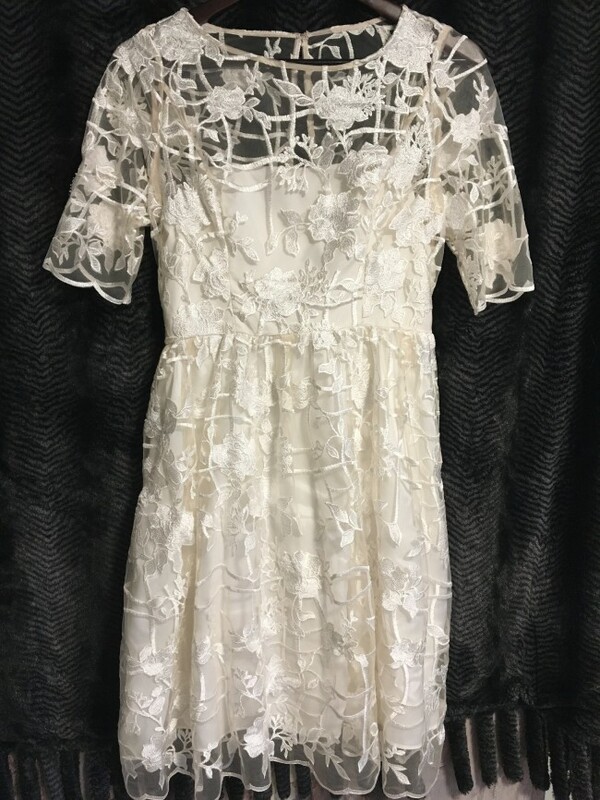 This dress is the exact match of the dress worn by Penny on the Big Bang Theory (her second wedding) It is a pretty and feminine dress perfect for a garden wedding or destination wedding. It was worn once (dry cleaned) after the wedding ceremony. It looks equally lovely wearing flats or heels. You can see more photos of this dress by googling "penny big bang theory Adrianna Papell wedding dress" to get a good idea of fit. The fabric overlay is sheer with floral embroidery. The sheer fabric extends a few inches beyond knee length hem. It is also sheer on arms, above bust and across back. It is a true size 6; across the bust and armholes are slightly snug so it is a better fit for smaller busts.